The following photographs were all acquired during house clearances in Preston & unwanted by the families or owners of the properties cleared. Our company provides house clearance services in all areas of Preston, Including Riversway St Georges Tulketh University Moor Park Lea Larches Ashton Ingol Brookfield Sharoe Green College. The James Cycle Company Ltd was formed in Birmingham on the 22nd May 1897 by one Harry (Henry William) James. The James factory was bombed and badly damaged in 1940 but, incredibly, was rebuilt within three months and more than 6000 machines were eventually supplied for military use by the end of the war. The James factory began as a highly-successful manufacturer of high-wheel (penny farthing) bicycles at the The James Cycle Co. Works at 121 Constitution Hill in Birmingham UK. The company began building motorized bicycles in 1902, powered by the Belgian-made 2 hp, 239 cc Minerva clip-on motor, and designed by Frederick Kimberley. 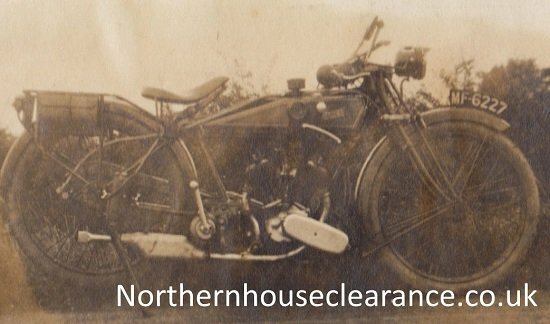 In 1951, the James Cycle Company was acquired by Associated Motorcycles Ltd. (AMC) due to financial difficulties. The first James two stroke appeared around 1913 and the company had, by then a fair reputation for well made and sturdy machines, with models suitable for solo or sidecar work. When the factory gates finally closed in1966 it brought to an end a long line of highly regarded motorcycles.